“Need a spot of advice,” my friend Joe rang me up one morning. “I’ve been thinking about getting myself a bike - actually it’s a gift from my wife - and I’ve been confused whether to go for the Triumph Bonneville or the Ducati Scrambler.” Lucky husband, I thought, amused by the feeling that he must have been a very obedient one to deserve an anniversary gift like that. And Joe wanted to do the purchase fast, before the wife changes her mind, and he wanted to decide on a bike that very same day and go bike shopping. Joe was particularly taken in by the classic looks of the Bonnie and he had zeroed in on the Bonneville T100, till he realized that the Ducati Scrambler is also placed slap bang in his budget. And his predicament is understandable – the Triumph Bonneville T100 retails for around Rs 7.3 lakh (on-road Delhi), while the Ducati Scrambler is available for Rs 7.68 lakh (on-road Delhi). Like Joe, there are many other ‘born again bikers’ – the average late 30s to early 40s executive or entrepreneur – who desires a superbike in the sub-Rs 10 lakh price range. It's a lifestyle choice, the urge to have a bike which would more often see the Sunday morning breakfast ride, or the occasional weekend ride to the nearest hills. It certainly isn’t easy advice to give, and I felt it just wouldn’t be fair to favour one bike over the other, unless we did a head to head comparison. And that’s how the idea for this comparison was born. It’s yesterday once more. And I do tend to go “sha-la-la-la…” in my mind whenever a classic crosses my path, and that familiar feeling is back strongly up, close with a Triumph classic. The Triumph Bonneville always holds a special place in my heart as a fine example of classic 1960s Brit bike styling. Dual tone colours, more chrome, spoked wheels and twin pea shaped exhausts add even more class to the T100. Twin-pod instrument panel consists of basic analog dials, with a speedometer, tachometer and digital trip and odometer. Faux carb bodies cover the fuel injection system to complete that authentic classic ‘carbureted’ look. It plays the ‘classic’ part to the ‘t’, although many would still consider it too old school. And those retro looks, although quite classy, can also be a turn-off for many. In a country where classic Brit bike styling has been synonymous and all-too common with thousands of Royal Enfields on the streets for over half a century, the Bonneville hardly warrants a second look. However, some do seem to prefer the relative anonymity of the Bonnie’s looks, while others want more bling from their ride. The Ducati Scrambler on the other hand, is a more modern approach in design to the iconic 1970s Ducati Scrambler. And it’s designed by 27-year-old Ducati designer Julien Clement, who decided the 2015 Scrambler would be just how the legendary bike would be today if Ducati had never stopped building it. And it’s a good looking bike, refreshingly modern with its classic design lines intact. So, the new Scrambler gets the classic tear drop shaped fuel tank, tall wide handlebar and flat single seat, reminiscent of classic ‘70s styling. But the round headlight gets a modern LED powered light guide around the rim and the single round instrument pod is all-digital too, with trip meters, speedo and a digital tacho combined in one single compact LCD unit. In all, the Scrambler is the classic modern retro bike, with state-of-the-art touches, yet simple and fashionable as the original. Both bikes feature twin-cylinder motors, but with completely different architecture and character. The Triumph Bonneville T100 features an inline-twin air-cooled engine, displacing 865cc and making 61PS power and 61Nm of torque. The twist at the wheels is available in plenty at low revs too, for better usability and entertaining pull. But the single most differentiator in the Triumph’s parallel twin is the smooth manner in which the power is delivered. Slot it into gear and open the throttle, there’s no sense of vibration through the rev range and power delivery is linear and well sorted, delivered in typical, parallel-twin refinement. The gearbox is a five-speed unit, and shifts are smooth and precise, with ratios well suited for riding in traffic as well as high speed highway cruising. The Scrambler’s engine though is a V-twin, dubbed the L-twin by Ducati. The air-cooled 803cc L-twin makes 76PS power at 8250rpm and 68Nm of torque at 5750rpm, and on paper, the figures do look slightly better than the Triumph. Thumb the starter and the characteristic V-twin comes to life with its ‘brap brap brap brap’ note. Toe it into first, release the clutch and the Scrambler’s character becomes apparent; the torque comes in low and strong and there’s enough grunt to pull wheelies effortlessly, deliberate or accidental, if you dump the clutch in a hurry. The gears slot in precisely and if you’ve ever owned or ridden a Yamaha RD350, the short ratios of the Scrambler will certainly remind you of the RD350. Click into gear, grab a handful of throttle, close throttle, pull in clutch, upshift, repeat, fast; and that’s a very entertaining cycle to repeat. Rev it through the gears and there’s enough juice to keep you entertained and wanting to keep the revs spinning high. But that’s where the vibes creep in from the L-twin as well, ever so slightly, but you can still feel them on the seat of your pants and on the handlebars. Now, here’s the thing. Ride a bike by itself, and the riding dynamics may impress you no end. But compare it to another, and the pros and cons stand out immediately. You begin to appreciate its pluses but the negatives also stand out starkly. That is the problem with the Bonnie. Ride it for a day and you will be suitably impressed with its comfortable riding position, taut, yet comfortable ride quality, and tight handling. The simple tubular steel chassis handles direction changes well, whether you are riding solo or with a pillion on board. The twin shocks at the rear and the traditional-looking front fork makes for a smooth, controlled ride, and soaks minor bumps and road imperfections with ease, even while cornering at speed. The brakes – a single disc at the front and a second disc at the rear, provide sufficient bite for confident braking to shave off triple digit speeds. But the lack of ABS, even as an option, is sorely missed. Then there’s the steering. The T100’s steering feels heavy and lethargic. Go around a set of twisties and even though the chassis and suspension is more than equipped to handle quick direction changes, the steering, probably due to the larger and heavier wheels, just gets in the way; there’s just no way to appreciate that heavy handlebar feel. So, if you are a corner carver kind of rider, the T100 is just not the bike for you. Swap bikes and get on the Scrambler, and the difference is apparent, immediately. If you’ve been introduced to motorcycling in the 1990s and cut your teeth on 100cc two strokes and the Yamaha RD350 like yours truly, the Ducati Scrambler will entertain you, over and over again. The tall, wide handlebar with the flat, single seat makes for a comfortable riding position. It’s almost old-school enduro ergonomics, but that is what makes the Scrambler a great bike to handle the urban jungle. Ride quality is taut, with the single Kayaba shock on the stiffer side. But it complements the tubular steel trellis frame, so lean it, swerve it or drift it, the Scrambler makes for a great handling bike, at any speed, over any terrain. Ride it over a few hundred kilometers though, and maybe you will begin to miss the T100’s plush ride quality. So if it’s the long haul you are looking at, the Bonneville T100 should be your choice, but for everything else, it’s the Ducati Scrambler that should be considered; it’s just too much fun on this small Ducati! Then there are the brakes. Like the Triumph, the Ducati Scrambler also has single discs at both ends, but it comes equipped with standard switchable ABS. So, you can switch it off for some off road fun, or have it on while riding on tarmac and in traffic. As it turns out, I wasn’t the only person Joe was consulting before deciding on what to buy. 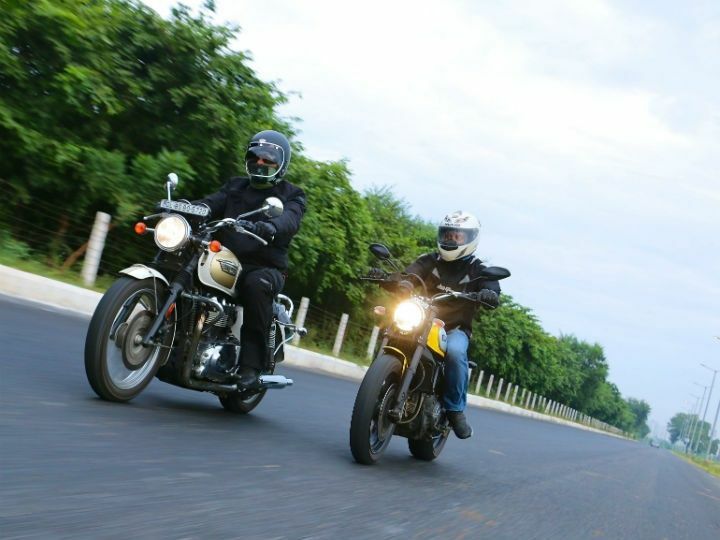 He had also reached out to another friend Surbhit, who owns a Triumph Bonneville T100. And even Surbhit had advised checking out the Ducati Scrambler as an option. Although taken in by the Scrambler’s sure footedness and flamboyant looks, Surbhit himself would admit to us that he would still choose the Bonneville over the Scrambler. So, Joe did the only logical thing he could think of. Take a test ride of both bikes and eventually he settled for the Scrambler. Why? It was just way too much more fun than the Bonnie. And I have to agree with him. The Ducati Scrambler is a hooligan of a bike, the bad boy who wants to be revved and accelerated hard through its six gears and leaned far into a corner. In comparison, the Triumph Bonneville T100 is a well-mannered, well-heeled gent, designed for a quiet cruise down the city streets or a long highway. Take a long twisty mountain road though, the Scrambler will have to wait for the Bonnie to catch up. Most of all, the Ducati Scrambler is just too much fun on two wheels, and for me, it brings back fond memories of an 18-year-old astride a two-stroke 100cc. So, now the question is, which one will I buy or recommend? The Ducati Scrambler, most certainly. But it comes with a catch. If you’re into long distance riding and thinking high passes and the Himalayas, there’s one small thing that goes against the Scrambler. Its recommended fuel is 95 Octane, and any motorcycle traveller will tell you how difficult high octane fuel is to come by, outside of major towns and cities. The Triumph though, will run on standard fuel, and will go the distance, over mountain pass and desert without the need for ‘premium’ higher octane fuel. For everything else, and a ride which will bring a grin to you every single time, it’s the Ducati Scrambler all the way.